Independence printable puzzle. 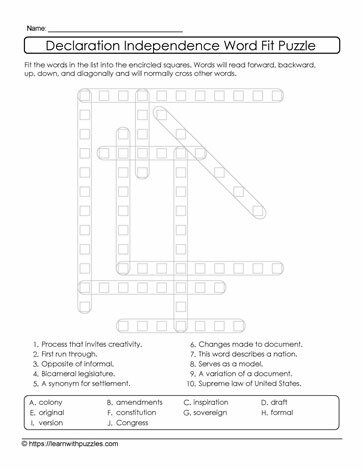 This wordfit printable puzzle engages students' vocabulary building skills and their problem solving skills. Use the word clues and the word bank to determine where the words fit. The downloadable puzzle is a combination of crossword and wordsearch puzzles. Suitable for students learning about the USA and its Declaration of Independence. Differentiate instruction with this printable puzzle, as required, for English language learners.